Nobody knows what comes to my mind every time I enter our loo for a bath. My mind is full of ideas and imagination, I can’t even share it to the world. But this morning, upon thinking of the last book I have read (actually an E-Book), I thought about my blog. This blog. Then it reminded me of a menu bar which I can’t find any relation to my future posts. I entitled it as “Turtle”. I don’t know why, or how I could pull out some posts under this menu. I just freakin’ love turtles. It was 2014 when I started collecting turtle key chains and magnets given by some of my friends. It was awesome! Until, I got fond of it, relatively, I started collecting anything that corresponds to how turtles look like. I even have a pet turtle – I named her Beck-Beck. Anyway, going back to this menu I was talking about earlier. 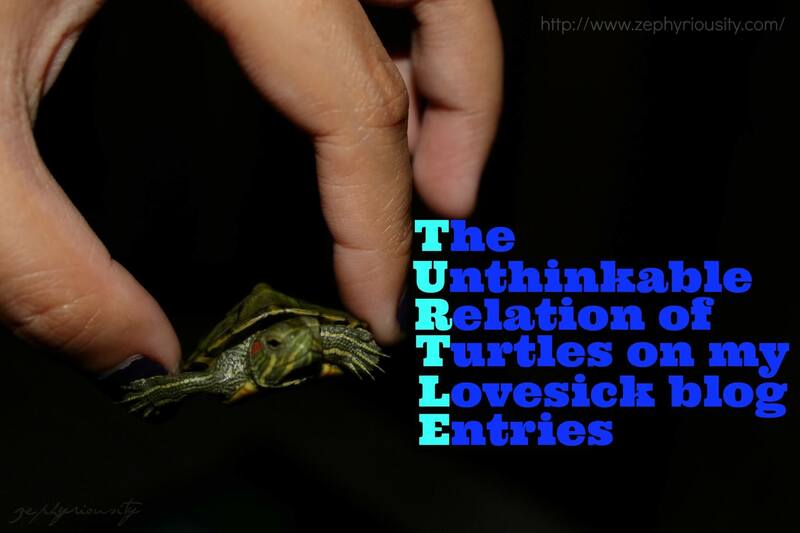 Since I decided to call myself a weird, nerdy, brainy kind of girl, I created an acronym out of the world turtle. See? I have found a way to get my post linked under this menu. I feel so wise right now. And that’s for now. I just really need to write something before I totally forget what my mind is telling me.